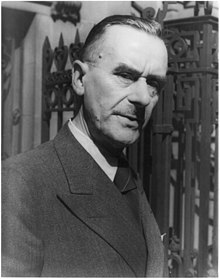 Paul Thomas Mann (German: [paʊ̯l toːmas man]; 6 Juin 1875 – 12 August 1955) wis a German novelist, short story writer, social creetic, filanthropist, essayist, an the 1929 Nobel Prize in Leeteratur laureate. His heichly seembolic an ironic epic novelles an novellas are noted for thair insicht intae the psychology o the airtist an the intellectual. This page wis last eeditit on 14 September 2017, at 15:19.